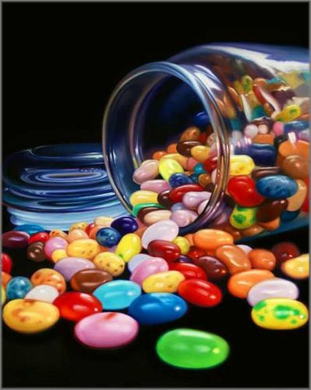 Doug Bloodworth limited edition giclée on canvas:"Jelly Beans"
About the Art:You are probably a jelly bean fanatic. Either that or you are a dentist looking for something to put on the walls of your office. To repeat, these are not photos. They are limited edition reproductions on canvas of the original oil paintings by Doug Bloodworth. These are not photos. They are limited edition reproductions on canvas of original oil paintings by Doug Bloodworth. DOUG BLOODWORTH enjoys evoking the viewer's nostalgic feelings of one's childhood, be that in comic books, games we played, or our comfort foods. In 1974 Doug earned a degree in Commercial Arts and went on during the early stages of his career to work in several genres of the art world. From painting caricatures to billboards, Doug's pursuits steered him towards the mastery of fine art techniques and a working mentorship with Marv Gunderson, the exclusive artist for the Marlboro brand. Painting iconic works on billboards all over the country was a highlight early on in his career and he still draws from the inspiration and lessons learned during the tour. Doug has since been commissioned to paint two 30' x 200' murals at Tampa's Tropicana Field, a project which took six months to complete and inspired him to focus solely on painting fine art pieces. The influence of paper printed comics from eras past is still tangible in Doug Bloodworth's photorealism. Combined with decades of artistic technique and the personal connection offered by his custom works, Doug's collectability is rapidly growing. He is now recognized in the international art community as one of the premiere photorealist painters of this period.